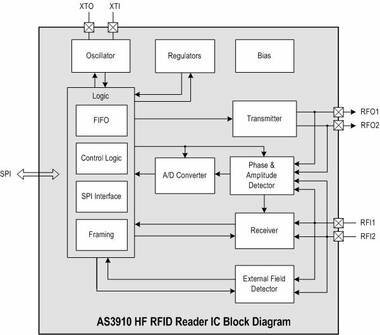 The AS3909 is a high performance HF Reader IC ideal for challenging applications. Unique features include high output power of 700mW and transparent mode to implement other standard and custom protocols. The AS3909 is used for proximity applications where the antenna is directly driven. The IC is optimized for battery powered or portable applications.